Just a reminder that there is no meeting in November. Our Holiday Party is scheduled for December 2nd. Please bring a stuffed animal donation. Dress in your Holiday Garb! Bring a main dish, salad or dessert with a serving utensil for the Potluck dinner. You will also need to bring your own plate and silverware. The newsletter will be available before Thanksgiving! I have been involved in 4H for over thirty years and each year have the privilege of giving a trophy to the best quilter. 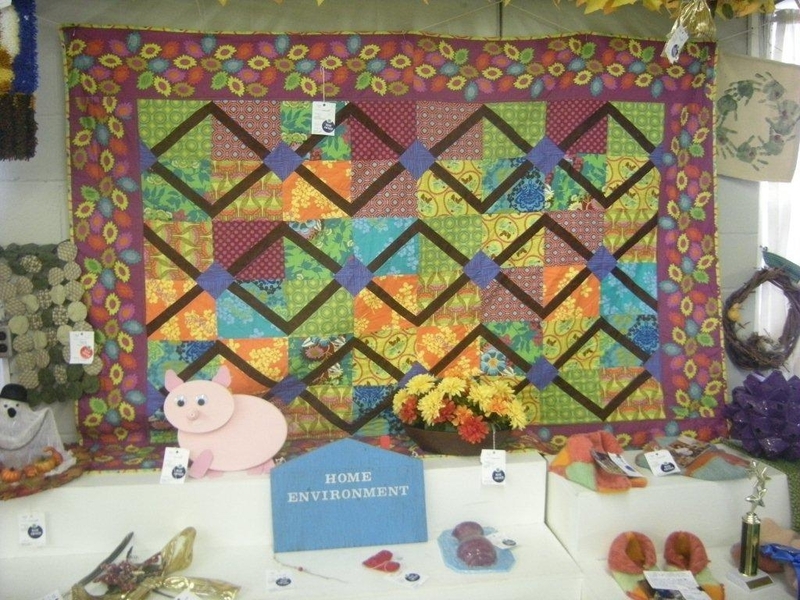 This year, the quilt was spectacular and I wanted to share a picture of what a teenager can produce! I’m saddened to report one of our members, Ruth Caisse, has lost a loved one. Her husband Steven P Caisse past away this week. Ruth attends the guild with her sister Sheila Ramsden. Our condolences go out to her and her family. Yes, this man is nuts! George and Virginia Siciliano’s lecture “This Guy Must Be Nuts” is very funny. While his work is extraordinary, he presents it with a sense of humor. Many of us have seen the results of his workshops at various quilt shows, but to actually see the originals is phenomenal. 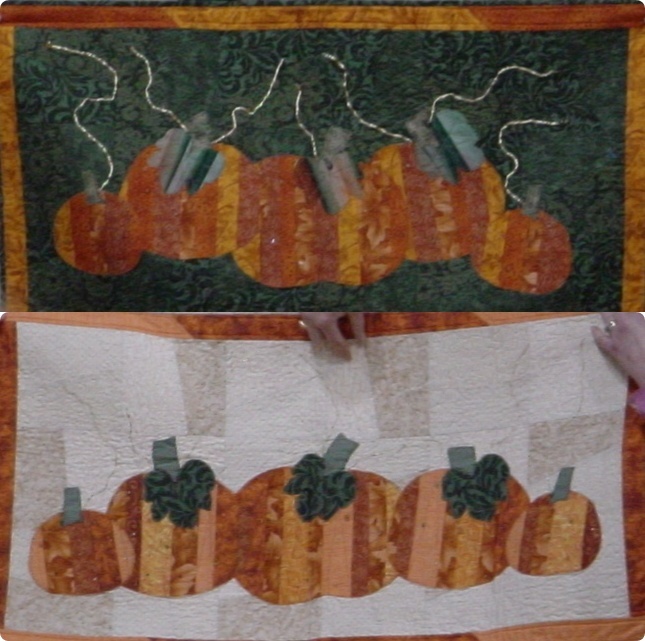 How George got into quilting is a very funny story, but I will not tell it because I would not be able to do it justice. If you missed his lecture, make sure you see him the next time he’s in the area. George’s lecture is a trunk show of his quilts starting with the first quilt he made through to his latest. He talks about his experiences both good and bad in his life of quilting. I loved his story of how he got roped into becoming a member of his local guild. We guild members can be sneaky. When George first started quilting, Virginia would hand quilt his quilt tops, but that got old. George explains his initial attempts at machine quilting. His story of using invisible quilting thread is great. His first quilt using it ended up being unquilted after if was bound. It’s was still unquilted at the time of his lecture. George is a very animated and entertaining lecturer. This evening was a great opportunity to be able to get a close look at his intricate work and see how tiny his pieces really are. The workshops were held at the Nevin’s Library in Methuen, MA. If you have never been to this library you are in for a treat. The library was built in 1883 by the Nevins family. The architecture is wonderful and when the addition was constructed they took care to keep it in a cohesive style with the original building. 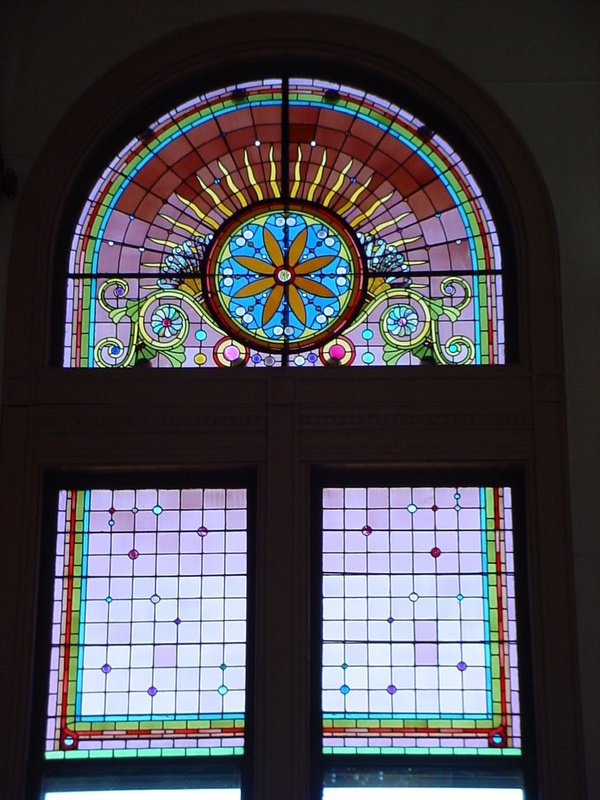 The stained glass in the room is original to the building. Carrie Zizza was busy drawing the stained glass to create a quilt from it. I took pictures of it so she could enjoy the class instead. Carrie, I hope to see the resulting quilt soon. Enough about the library, we had two classes. One on Friday and again on Saturday. George is very patient with his students. He has everyone gather around his machine so he can demonstrate his technique. The ruler George designed (a.k.a George’s Tool) for foundation piecing aides in trimming and lining up the next section to be sewn and is easily used by both right and left handers. He demonstrates how he cuts and stacks each round of logs as he goes along. This makes the assembly go a little quicker. Following George’s instructions we were able to create one of his ultra mini blocks with precision. George showed us a trick when it comes to assembling the blocks. Instead of using pins, he uses double stick tape. That way he can check to make sure the blocks are lined up and adjust as necessary. 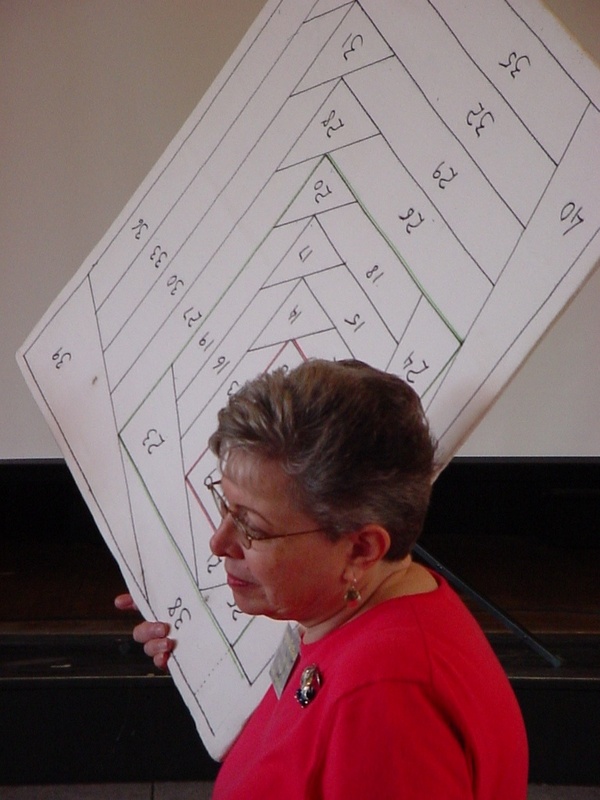 As George is demonstrating the block assembly, Virginia uses an extra-large version of the block to point to the piece George is talking about. With the block being so small it helps to see a large version so you know exactly what George is working on. All in all this is a great class and lecture. Will I continue with foundation piecing? I’m not sure. I was never a big fan of paper/foundation piecing, but after taking the class I understand the do’s and don’ts a little better. 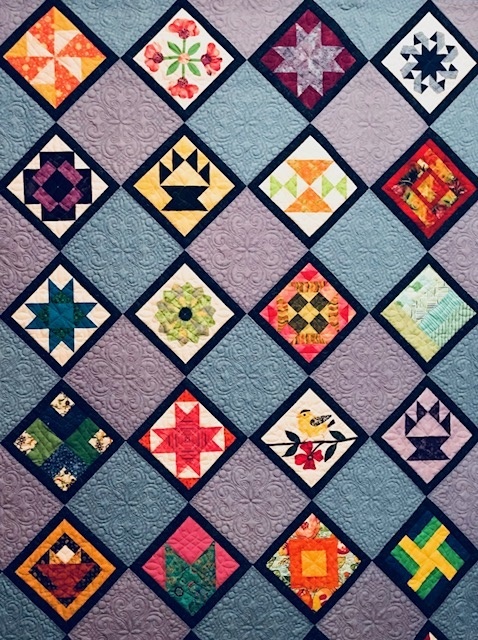 This entry was posted in Guild Activities, MVQ, Programs, Workshops and tagged Foundation Piecing, George and Virginia Siciliano, Miniature Quilts, Siciliano. Beth Helfter is a local, hailing from Pepperell, Ma. Her lecture “Perfection Is Overrated” is pretty gutsy. How many of you would stand up in front of a bunch of quilters and parade all your quilting mistakes? Well, Beth does it with flair. It just goes to show beauty is in the eye of the beholder. 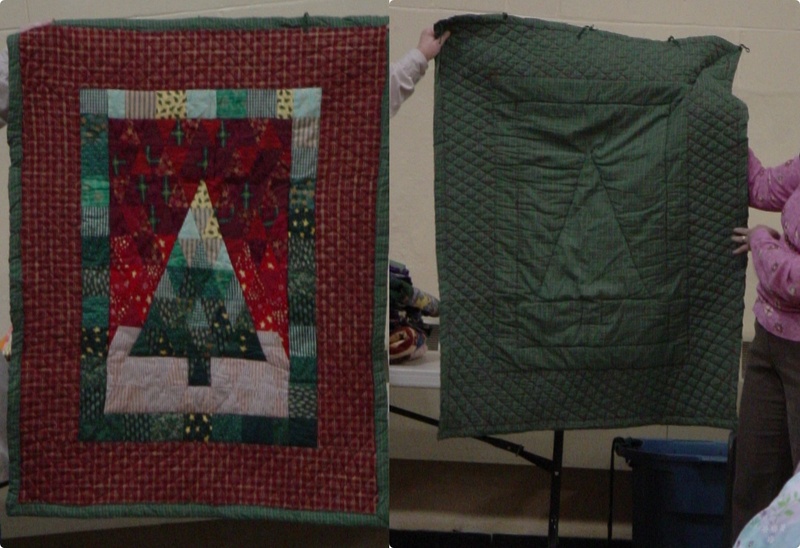 I, personally, might burn the Christmas Tree, but then again it shows how far she has come in her quilting skills. Beth has a lot of creativity. I’m not big into applique, but can appreciate that a flower placed in the right position can hide a multitude of sins. 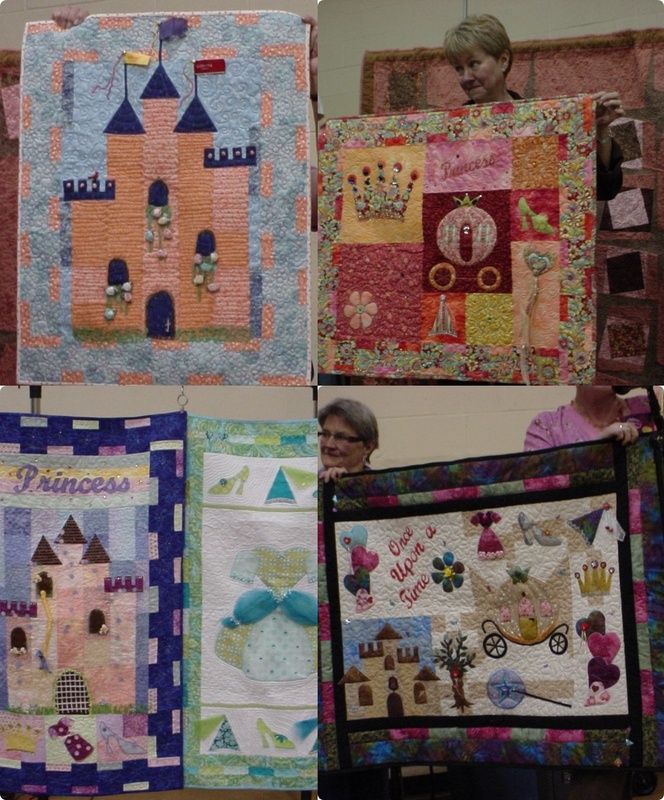 It was great to see what different backgrounds can do for a quilt. I’m not sure if I like the green or beige pumpkins. Beth’s princess series is very beautiful. What little girl would not like those quilts on her wall? The workshop “syncopated ribbons” was enlightening, but a challenge for those who like precision. You start with a block and add random strips of fabric (e.i. ribbons) to each side at odd angles. It’s reminiscent of a crazy block. Once your blocks are done, they are squared up and cut into half square triangles then pieced back together. This really give you a random looking block. Beth also demonstrated how she assembles her scrappy borders. They are foundation pieced from the excess trimmed off during squaring the blocks. Unfortunately, I was so intent on making my blocks I forgot to take pictures. I did get some of the various colors used in class. I hope to see many at show n’ tell. This entry was posted in Guild Activities, Meetings, MVQ, Programs, Workshops and tagged Evapage Designs, Perfection is Overrated.